Her social media feed has often been fodder for conservatives who do not agree with her self-described democratic socialist views. Rep.-elect Alexandria Ocasio-Cortez, D-N.Y., blasted Donald Trump Jr. in a tweet on Friday after he posted a meme suggesting her democratic socialist ideology would cause Americans to start eating dogs. "I have noticed that Junior here has a habit of posting nonsense about me whenever the Mueller investigation heats up," she tweeted, referring to special counsel Robert Mueller. "Please, keep it coming Jr — it's definitely a 'very, very large brain' idea to troll a member of a body that will have subpoena power in a month. Have fun!" On Thursday, Trump Jr. posted a meme to his Instagram account, which included a composite image of Ocasio-Cortez and President Donald Trump. The top image has Ocasio-Cortez asking, "Why are you so afraid of a socialist economy?" The second picture with Trump then says, "Because Americans want to walk their dogs, not eat them." "It's funny cuz it's true!!!" Trump Jr. wrote in the caption. His Instagram account has 1.5 million Instagram followers and the post received over 67,000 likes as of Friday afternoon. Trump Jr.'s girlfriend, Kimberly Guilfoyle, responded to Ocasio-Cortez on Twitter, saying she was "deeply troubled" that the lawmaker was threatening to subpoena someone who had criticized her. 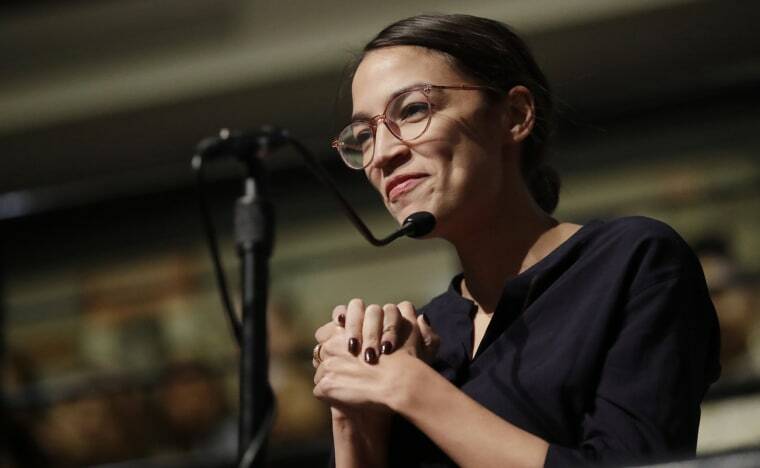 Ocasio-Cortez, 29, a Democratic Socialist, became the youngest woman ever elected to the House in November when she won her race in New York's 14th congressional district of Queens and the Bronx. She was thrust into the national spotlight after she beat longtime Democratic Rep. Joe Crowley in an unexpected primary upset earlier this year. Her social media feed has often been fodder for conservatives who do not agree with her self-described democratic socialist views. In the past, she has also used her social media to talk to voters and respond to criticism. Last month, she ripped Fox News in a series of tweets for mocking "working-class people" after the news channel did a segment on her struggle to rent an apartment in Washington, D.C.